Jr., H.W. (2013). Dust bowl. In S.L. Danver (Ed. ), Encyclopedia of politics of the American West. [Online]. Washington: CQ Press. Available from: https://search.credoreference.com/content/topic/dust_bowl [Accessed 21 April 2019]. Jr., Hugh W. Foley. "Dust Bowl." Encyclopedia of Politics of the American West, edited by Steven L. Danver, CQ Press, 1st edition, 2013. Credo Reference, https://search.credoreference.com/content/topic/dust_bowl. Accessed 21 Apr. 2019. Area of c.40 million ha (100 million acres) of the Great Plains, USA, that suffered extensively from wind erosion. Due to drought, overplanting and mismanagement, much of the topsoil was blown away in the 1930s. Subsequent soil conservation programmes have helped restore productivity. Coinciding with both drought and economic depression in the 1930s, the Dust Bowl was an ecological, agricultural, and financial disaster for people in a five-state area centered by the Oklahoma panhandle. For about ten years (1930–40) the effects of the Dust Bowl era were felt across a wide swath of the Great Plains region. Because of drought during these years, fields went bare as far north as South Dakota and Wyoming and as far south as Texas. Additionally, farmers and corporate agricultural entities failed to exercise proper crop rotation necessary to preserve nutrients in the soil. Because of this lack of foresight, repeated plowing, and overgrazing by cattle, a layer of loose topsoil developed and was easily picked up by windstorms and carried across the Great Plains in huge dust storms. After several dust storms in 1933 and 1934, the region acquired its nickname because of the biggest dust storm, occurring on April 14, 1935, and remembered as “Black Sunday,” when winds of sixty miles per hour picked up tons of dirt and created a giant cloud that darkened the sky, covering towns, property, livestock, and people in a thick layer of dirt from western Kansas to the Texas panhandle. 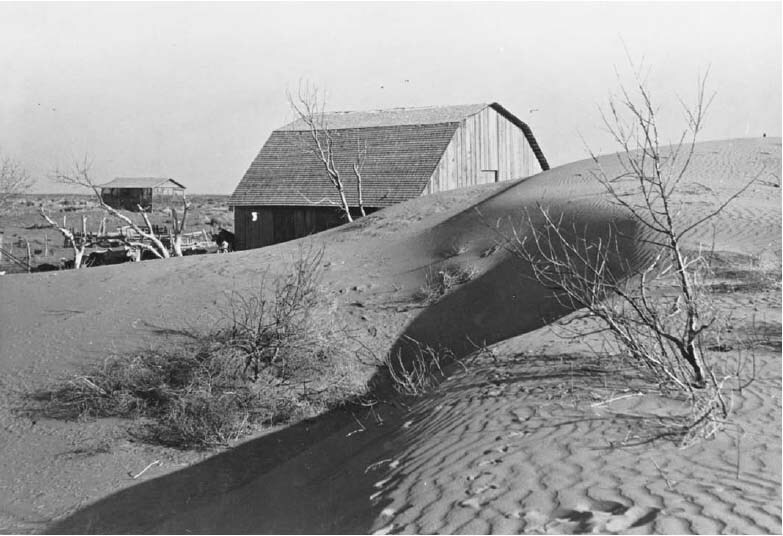 The winds of the “dust bowl” piled up large drifts of soil against this farmer's barn. Prior to the mid-1800s, the Great Plains was considered a desert, unsuitable for agriculture because of an absence of surface water: It was vacant of trees to provide lumber for construction and still hostile because of the presence of several American Indian tribes. Thousands of people moved to the Great Plains anyway after the Civil War's end in 1865 to become land owners under the provisions of the Homestead Act of 1862. After Native Americans, who had been hunting the buffalo on the Great Plains for thousands of years, were squeezed out of the area, farms and ranches developed in places where they had never been before. At first, large ranches attempted to raise cattle; however, the grasses could not sustain consistent grazing, and subsequent harsh winters and droughts encouraged different land use strategies. As more lands were open to settlement, waves of immigrants from Europe moved to the Great Plains in the 1880s and 1890s, followed by an unusually consistent sequence of years with enough rain to provide a sense of agricultural security. World War I (1914–18) caused a further rise in prices for farm products, inspiring even more planting without allowing the soil time to recover. Alongside the Great Depression, which began with the U.S. stock market crash in 1929 that sent prices plunging for farm products, drought hit the region beginning in 1930, and the land had no ability to sustain any agricultural growth or employment. As land went fallow, and technology allowed more work to be accomplished by fewer people, property owners had less need for the tenant farmers who worked the land to both pay for their subsistence and their rent on the land. As a result, many average tenant farmers became “dust bowl refugees,” and headed west for jobs and survival. Many migrants already had friends or relatives who had responded to advertisements for work in Arizona's cotton fields, and California had long been depicted in popular culture as a bountiful land of fruit, good weather, and opportunity. While people left the economically depressed and agriculturally defunct area from all the states affected, which included Texas, New Mexico, Colorado, Kansas, and Nebraska as well as Oklahoma, most migrants were referred to derisively as “Okies” because many of them were from Oklahoma. During the 1930s, as many as 60 percent of Oklahoma farmers were tenant farmers who lost their livelihood because of the Dust Bowl, the Depression, and the shift from tenancy farming to seasonal wage labor by property owners. John Steinbeck's novel The Grapes of Wrath dramatizes this story. Iconic photographs of the era also often depicted destitute Oklahomans leaving the state in rattletrap vehicles overloaded with household goods and family members. Folk musician Woody Guthrie depicts the period powerfully and humorously in his songs “The Great Dust Bowl Storm,” “Talking Dust Bowl Blues,” “Dust Bowl Refugee,” “Dust Cain't Kill Me,” and “I Ain't Got No Home.” Oklahoma has also often been referred to as “The Dust Bowl State.” The federal government enacted a number of measures to help ease the affected areas during the 1930s, but nothing helped as much as rain returning to the area toward the end of the 1930s. Author Donald Worster has documented drought cycles occurring about every twenty years in the region, a pattern which continued in the 1950s, 1970s, 1990s, and 2010s. Gregory, James N. American Exodus: The Dust Bowl Migration and Okie Culture in California. Oxford University Press New York, 1991. Lowitt, Richard. The New Deal and the West. University of Oklahoma Press Reprint. Norman, 1993. Worster, Donald. Dust Bowl: The Southern Plains in the 1930s. Oxford University Press New York, 1979. In ecology, the sum of conditions affecting a particular organism, including physical surroundings, climate, and influences of other living organisms.